Dr. Mark Richards of Ageless Impressions – Plastic Surgery Institute explains how excess breast tissue in men occurs and how this condition can be treated. Washington, DC — Affecting up to 20 percent of boys and men, gynecomastia is a condition in which unwanted excessive breast tissue develops in the chest of males. 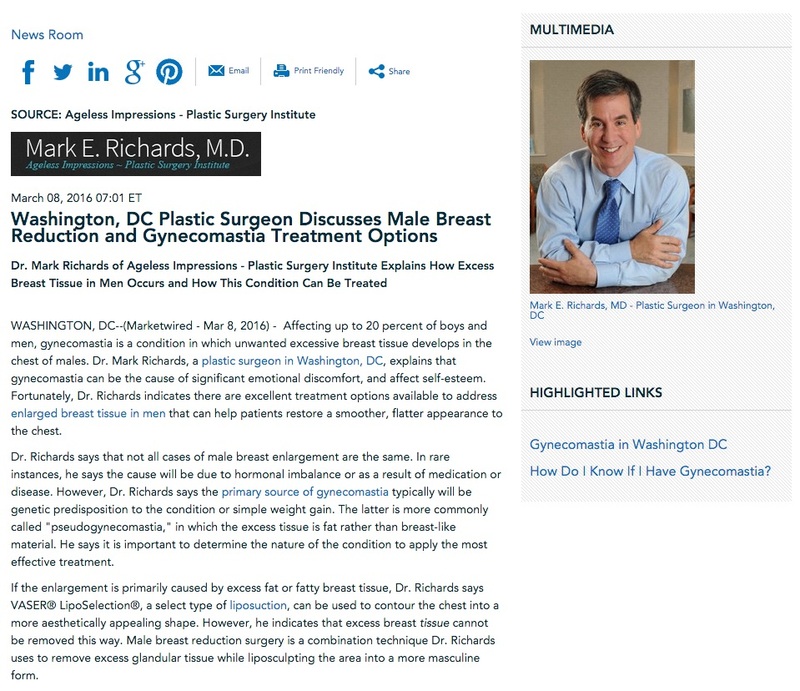 Dr. Mark Richards, a plastic surgeon in Washington, DC, explains that gynecomastia can be the cause of significant emotional discomfort, and affect self-esteem. Fortunately, Dr. Richards indicates there are excellent treatment options available to address enlarged breast tissue in men that can help patients restore a smoother, flatter appearance to the chest. Dr. Richards says that not all cases of male breast enlargement are the same. In rare instances, he says the cause will be due to hormonal imbalance or as a result of medication or disease. However, Dr. Richards says the primary source of gynecomastia typically will be genetic predisposition to the condition or simple weight gain. The latter is more commonly called “pseudogynecomastia,” in which the excess tissue is fat rather than breast-like material. He says it is important to determine the nature of the condition to apply the most effective treatment. If the enlargement is primarily caused by excess fat or fatty breast tissue, Dr. Richards says VASER® LipoSelection®, a select type of liposuction, can be used to contour the chest into a more aesthetically appealing shape. However, he indicates that excess breast tissue cannot be removed this way. Male breast reduction surgery is a combination technique Dr. Richards uses to remove excess glandular tissue while liposculpting the area into a more masculine form. Dr. Richards emphasizes that enlarged breasts in men is a common condition, and individuals experiencing this concern should know they have options to address it. He advises men considering gynecomastia treatment to seek out a board certified plastic surgeon who has extensive experience with male breast reduction procedures in order to increase the chances of attaining results that meet their goals. Dr. Mark Richards is the director of Ageless Impressions – Plastic Surgery institute, located in the Bethesda, MD and Washington, DC area. He was certified by the American Board of Surgery in 1989 and is certified by the American Board of Plastic Surgery. A graduate of Yale University, he earned his medical degree from the University of Maryland School of Medicine. Dr. Richards is the recipient of numerous awards, including recognition as a Top Doctor by US News & World Report and as one of America’s Top Surgeons by the Consumer’s Research Council. In addition to being a member of the American Society of Plastic Surgeons (ASPS), he is also an advocate of continuing medical education (CME). Dr. Richards is available for interview upon request.